You work long hours every day and are always out of the house on a regular basis. And, you might not have time to feed your dog every day because of your busy schedule. Then an automatic dog feeder may save you the time and money in spending on pet sitters or frequent home visits. Currently, there are several models available in the market today; each boasts its unique benefits and features. But before you decide the best automatic dog feeder, we have several tips to guide you in making the right decision. What is an automatic dog feeder? 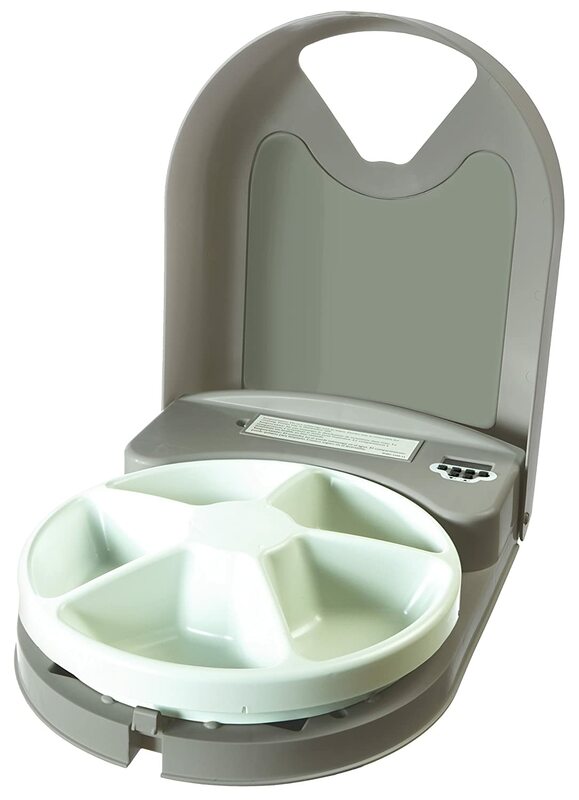 An automatic dog feeder ensures that a dog gets his regular meal even when its owner is at work or out of town. It also helps maintain portion control for dogs especially if you have a pet with consistent trouble with overeating. If you do have a household with multiple pets, then multiple feeders or large capacity of automatic dog feeders may be necessary. 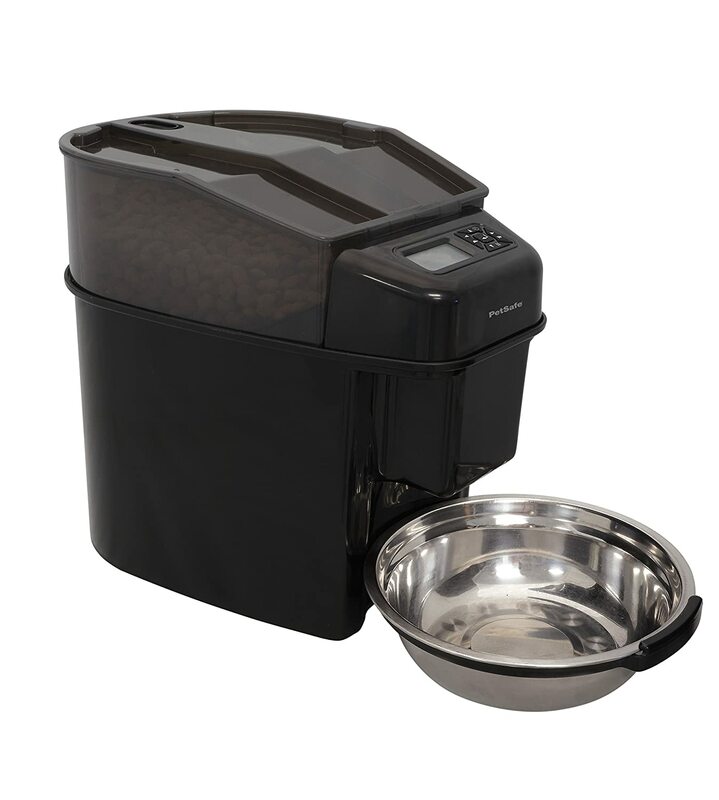 Our first item on the list is PetSafe 5-Meal Automatic Dog Feeder. It currently has a 3.8-star rating on Amazon with more than 2,000 verified customer reviews. One of this feeder’s unique feature is its easy-to-use digital timer which allows you to customize your feeding time in one-hour increments. Aside from its digital timer, it also comes with a dishwasher-safe food tray which helps in convenient cleaning, especially for busy pet owners. Most of the customer reviews reveal that what they love about this product is its flexibility. This feeder allows pet owners to work on their normal schedule without worrying about their dog at home. Aside from this, it also has a BPA-free plastic construction which makes it Eco-friendly. Since the 5-meal feeder is suitable only for dry foods, it doesn't work well for wet foods because it is neither insulated nor airtight. Also, when purchasing, make sure to read instructions carefully especially when trying to figure out how to set the time. Also, it requires 4 D batteries to operate which does not include on its product package. For people on the go, this feeder is excellent and can help in feeding your dog on a regular time interval. It works well with dry foods. So if you feed your dog with wet foods, you might want to think of other choices. However, if dry foods are what you mostly feed your dog, then this automatic feeder can be a good option. 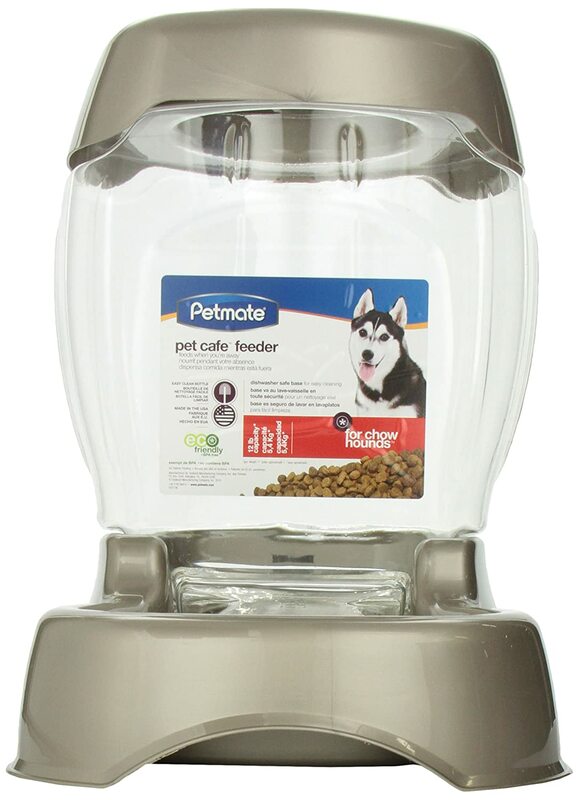 What most customers love about Petmate Pet Café Feeder is that it is gravity fed. So the food stays fresh and clean. Its bottles are made up of PET plastic and come with a dishwasher safe base and lid, which makes it easy to clean and fill and doesn’t tip over very easily. Most reviews only complaint is that it is too huge for their pet. Some customer would want a smaller version of this product for a small eating portion. If you have a household with multiple pets, then this feeder might be good for you. Its huge size can be suitable for busy pet parents for fewer refills. If you are always out of home for a short vacation, it would be a good option for you. This product has a rating of 4.4 on Amazon with over 1000 reviews. Let’s check out why this product is such a hot item and best seller. With PetSafe Healthy Pet Simply Feed 12-Meal Automatic Feeder, you can choose and customize your dog’s meal for up to 12 meals per day. Yes, you read it right. This product has different options which helps in ensuring your pet dog is eating with the right portion of food. Options include Slow Feed and Pause Feed. The product’s conveyor belt mostly dispenses not only dry, but semi-moist pet foods as well. This product does not come with an AC adapter so you need to invest on a good adapter for this product. Also, program can be a bit tricky for some which is why proper knowledge on how this product works is highly recommended. Overall, this product can be useful for you and a good tool in helping you feed your dog automatically. Its programming has 3 highly practical feeding modes which can be reliable in terms of amount and time of food dispensing. It connects by Wi-Fi to your home in under one minute. One of its best features is that it has a built-in webcam so you can always check on your pet in real time. Aside from this, each of the six compartments can hold up to 8 oz cup size which helps you decide how much to feed. There are also notifications of when your pet has been fed for you to check even when you are outside the home. 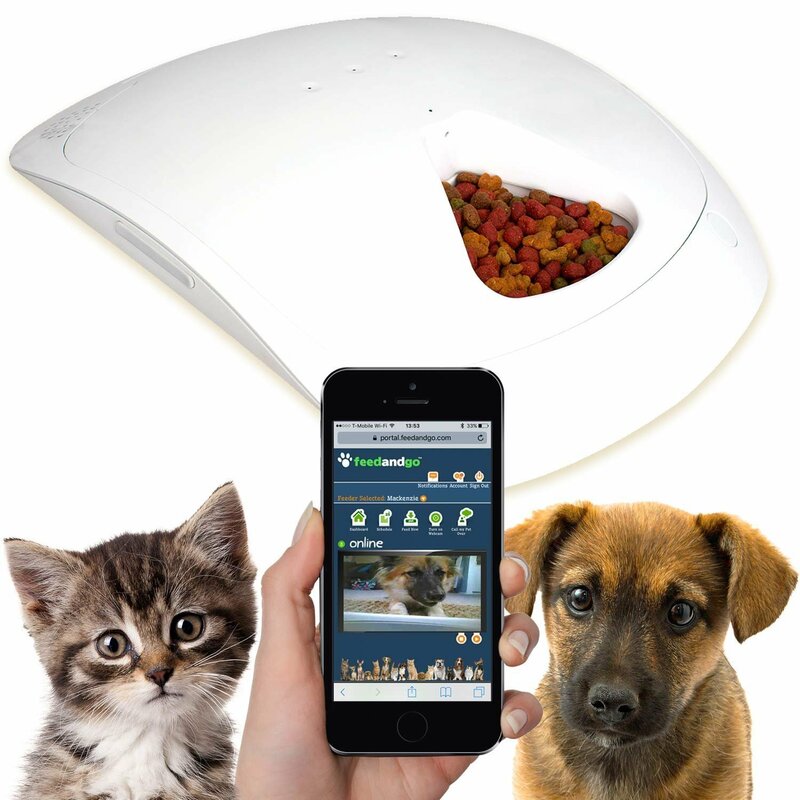 Also, with this feeder, you will have the ability to control multiple pet feeders using your smartphone. It works well with iOS, Android, and Windows. Feed and Go Automatic Pet Feeder does not work well with wet food. It is not 100% air-tight which is why wet foods cannot last long than 48 hours. Also, some customers suggest improvements on its camera where they could tilt, zoom and have a wide angle lens. It ensures a more convenient view of their pet while eating. This product perfectly suits techie people who are always outside the home. However, they still wants to ensure their pet dog is eating on a regular basis. The ability to check on your pet using a webcam is also one of its interesting features. It makes this product one of the most loved and best automatic pet feeders for most customers. All of the products mentioned above are totally useful and works great. However, if you have to narrow it down, PetSafe Healthy Pet Simply Feed as well as Feed and Go Automatic Pet Feeder are two of the best choices. Both products have proven to be versatile and easy to install. PetSafe Healthy Pet Simply Feed boasts of its ease to use, which allows you to customize your feeding time. On the other hand, Feed and Go Automatic Pet Feeder comes with a built-in webcam which can be controlled using your smartphone. Personally, among these two I would go for this feeder as it has all the right features at an affordable price. Is the feeding program temporary or permanent? Would you feed in small or large portions? Are the meals to be served wet or dry? The amount of food should I put on the dog feeder? How many pets are in my household? How does my pet behave during feeding time? Healthy foods are beneficial when paired with a structured feeding plan that considers both the pet’s needs and owner’s schedule. Having an automatic dog feeder can help you in setting up a feeding schedule for your dog without compromising your busy schedule. With an automatic dog feeder, you don’t need to feel guilty about leaving your dog alone at home. You need not worry whether your dog is starving, overeating or not eating on time. The right model helps in ensuring your pets are fed the right foods at times they need. There are lots of products available on the market today. You just need to be wise enough to decide and choose which one suits you best.